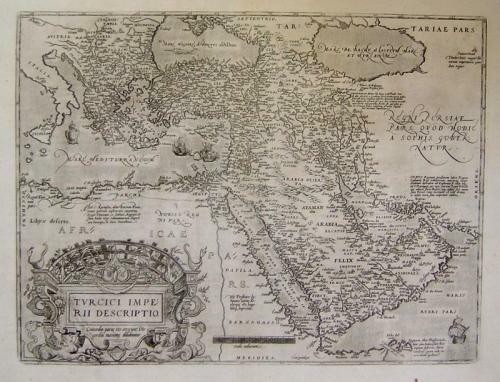 Title: 'Turcici imperii descriptio', 1579 latin edition. Reference literature: MARCEL P.R. van den Broecke, Ortelius Atlas Maps, An illustrated Guide, Number 168. "...Succeeded by plate 169 which has a cartouche with two putti at the top, rather than the present unornamented strapwork. Approximate number of copies printed: 1.675." From the next plate are ca 5.625 copies printed. The map has a wealth of detail. Overall excellent condition.